You are all familiar with Phoebe from Lou Messugo who lives in Nice and has often been featured in this weekly blogger round-up. 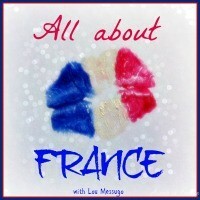 Today, she is beginning a new monthly link-up focussing on posts about France from bloggers across the glob. I’ve contributed my post on the Ten Top Châteaux in the Loire Valley. As I’m writing she already has 16 other participants, including such diverse subjects as the 2CV, the tooth fairy, how to talk to your Muslim kids about Charlie Hebdo and the beautiful Alsatian village of Colmar. Enjoy! by Phoebe from Lou Messugo, a traveller, francophile, expat, mum and foodie now living in Roquefort les Pins where she runs a gîte after many years of travelling and living in Asia, Eastern Europe and Australia. Welcome to the first All About France blog linky (and my first time hosting a link-up). I’ve been thinking about starting this for a few months now and keep getting side tracked, but there’s no time like the present….So if you write or have written about France in any shape or form then please join in. You don’t have to write regularly about France, an old post about a holiday is perfectly appropriate, for example. Feel free to link old or new posts, as long as they’re about France or French they’re welcome. Read more. This entry was posted in France, French customs, Weekly Blogger Round-Up and tagged blog posts about france, Lou Messugo. Bookmark the permalink. More lovely reading to while away the morning. Will the jobs ever get done? @Helen – Yes, lot’s of new blogs that I didn’t know about too! This escaped me Rosemary, I didn’t realise you’d shared my link up on your round up. Merci mon ami! Very kind of you and much appreciated. One week later, just as the linky is about to close there are 48 posts linked which I”m delighted with! Now the pressure is on to make the 2nd one a success, starting on 5th March. You’re very welcome Phoebe! 48 is a great score! I’m sure it will continue to do well. Good luck.